2013 Mazda 6 Estate unveiled | What Car? 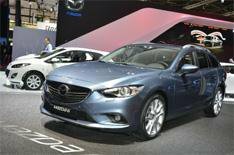 The 2013 Mazda 6 Estate has been unveiled at the 2012 Paris motor show. The new Mazda 6 saloon was revealed last month. The all-new estate version shares the same sleek bodywork up to the central pillar, but has a more practical hatchback rear end. The new 6 Estate has a boot capacity of 522 litres with the seats up and 1664 litres with the seats down, which is on par with rivals from Ford and Volkswagen. Like the new saloon version, the 2013 Mazda 6 Estate is built using Mazda's 'Skyactiv' technology a combination of lightweight construction and new engines and gearboxes that's designed to improve fuel consumption and reduce CO2 emissions. The engine options will be a 2.0-litre petrol and two 2.2-litre diesels. Unlike the current car, which is available in hatchback, saloon and estate forms, the new 6 will be available only as a saloon or estate. A new 'four-door coupe' similar in character to cars such as the VW Passat CC and Mercedes CLS is likely to be added to the range, however. Prices start at 21,265 for the lower-powered petrol version in SE-L trim, rising to 28,045 for the higher-powered diesel in Sport Nav trim and fitted with the automatic gearbox.